Mission critical is more than high availability or disaster recovery: it is a mindset. Mission critical solutions need to perform well, be easy to manage, reduce cost, and lower risk. Our methodology – the SQLHA Framework – guides all of our engagements. The SQLHA Framework covers the entire IT lifecycle. It helps us identify and deliver the most optimal outcomes and solutions and ensures what we promise is what you get. 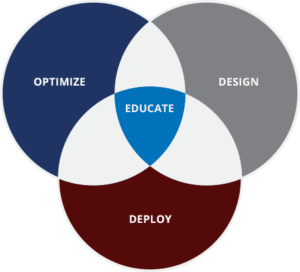 There are four key areas to the SQLHA Framework: design, deploy, optimize, and educate. Before you can build a house, you need the right blueprint. SQLHA® offers experienced SQL Server consultants who have designed and prototyped solutions for smaller companies as well as some of the largest in the world. Let us help you define and prove out the best roadmap for your company, whether your solution is fully on premise, physical or virtual, in the public cloud, or even a hybrid solution bridging on premise with the public cloud. Successful SQL Server deployments can impact many different aspects of your IT environment, such as networking, storage, security, and more. SQLHA® understands these connections and can ensure your deployment ecosystem works for you, not against you. Our experts help you navigate the fastest and safest path to a successful SQL Server deployment. SQL Server needs proper care and feeding from administration to performance as well as monitoring. Having a specific performance pain point or want ongoing assistance? Let SQLHA® assess your environment or diagnose your problem. We will let you know where you are healthy, and where you would need some prescriptive guidance for corrective maintenance. Educating our customers is central to our mission. If you care about mission critical, learn from the experts at SQLHA® . Our experts are always speaking at conferences such as PASS Summit, SQL Bits, and TechEd, and have even taught rotations of the Microsoft Certified Masters – SQL Server. If you want to learn from the best, look no further. Training falls under our SQLHAU® umbrella. Learning is more than just sitting in a classroom or staring a disembodied voice on a computer speaker; we believe that hands-on experience gives a deeper understanding. We pioneered the use of labs for complex SQL Server availabilty scenarios.